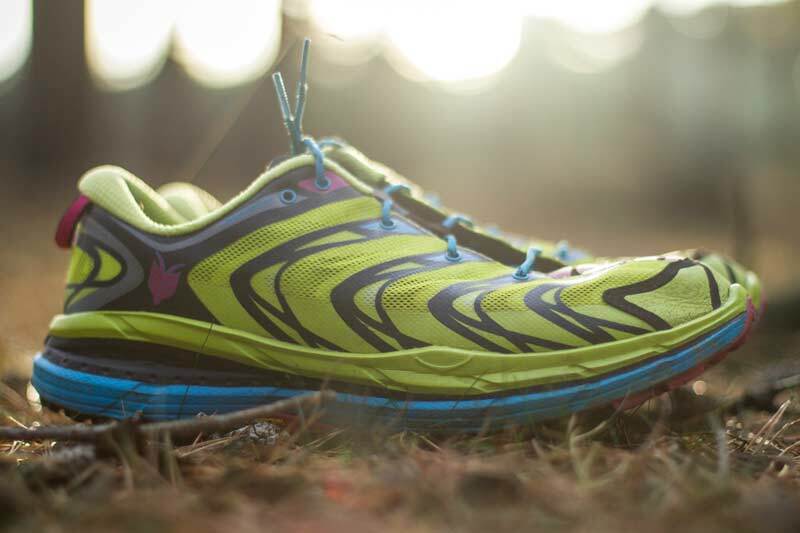 Hoka One One’s Speedgoat is a light, lively, all terrain shoe that puts comfort centre stage. Superb cushioning with a substantial outsole and good flexibility combine with a sticky vibram sole and full 4mm lugs to provide a shoe that comfort well beyond its low weight. Suitable for road use along with trails it’s a true multi-surface shoe that’s rapidly amassed a loyal following. After the explosion of Born for Run and the minimal movement, things changed. When an industry was seeing what they could strip out of cushioned shoes, designers stuck their necks out and pushed for change. 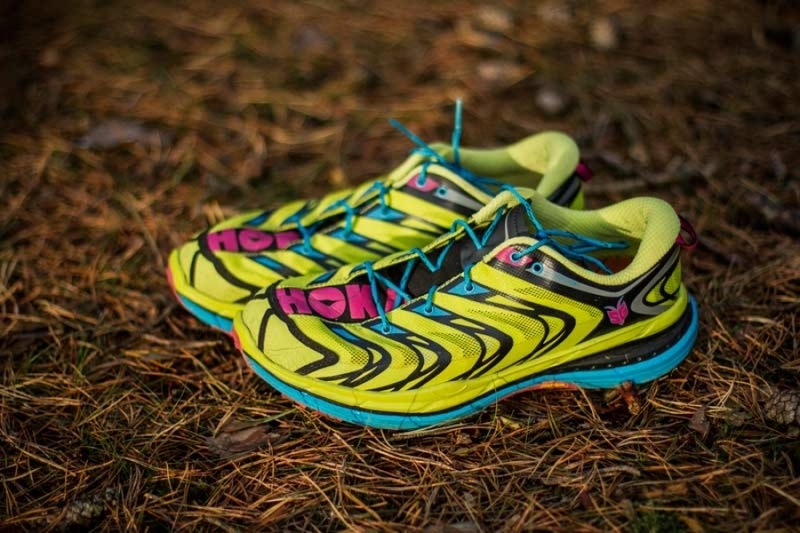 Hoka One One were and still are at the head of this new age of maximal shoes. To clarify, maximal doesn’t mean huge heel to toe drops, stilts attached to your ankles and a no feeling of the trail. Through Hoka’s range, the heel to toe drops are what you would expect from a conventional shoe. What differs is the depth and feel of the midsole. Each shoe is tuned differently, offering something for everyone on the trail. After meeting the UK team at Keswick Mountain Festival, I was eager to give the brand a go. I managed a quick jog around the festival site and waited patiently. The Speedgoat has legendary beginnings. Hoka, favoured by the ultra scene have been growing an impressive line up of elite athletes including Sage Canady and Magdalena Boulet. However it is Karl Meltzer that steals the show. Karl “Speedgoat” Meltzer (there’s a clue) is legendary for winning more 100 mile ultra marathons than anyone else. Having worked with the team, it was decided to create his ultimate shoe, the Speedgoat, able to tackle all that he takes on and the rugged Speedgoat 50km race. 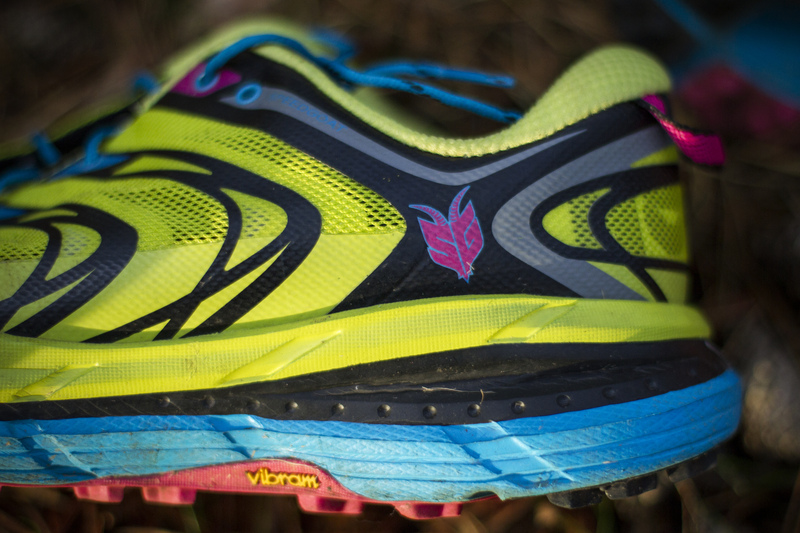 From the ground up, the Speedgoat has been designed for technical trails that never let up. Aggressive lugs, plenty of overlays and a large rand to protect toes all make it stand out. And lets not forget the colour. It’s bold! However the thing that stood out the most as I pulled a shoe from the box was the weight, or lack of. The Speedgoat is a big shoe, in an age of paying more for less, you really do get more for your money! But it’s light. Really light! At 275 grams per shoe you head struggles to comprehend why they aren’t much heavier. Furthermore when slipping feet into the shoe, they aren’t restrictive and cumbersome, despite a fair wedge held underneath you. The Speedgoat’s arrived just in time for my week in Chamonix. I walked at 3600 meters, ran the Vertical Kilometer, walked around town and lived in them for the majority of my time out there. I’ve since ran my local trails, which form my control, neutral ground which aids direct comparison. As I said earlier, they are aggressive. Really aggressive. The 4mm Vibram® MegaGrip Hi-Traction Outsole bites hard, sticking its lugs deep into the crud beneath. With an open tread pattern, they promote mud shedding and self clean well. The lugs are evenly spaced on the outer edges of the sole, providing reliable traction in corners or off camber sections. When constantly zig sagging and switching direction on the VK course, I knew when I planted my foot, it would hold strong. With no lugs on the main body of the heel, and a strip in the middle of the forefoot these are not an out and out mud shoe. They cope well on mud, but equally run well on rocky/more maintained trails. You only need look at images of the Speedgoat 50K course to see where they gained inspiration from. Sips on each lug, allow them to deform and gain greater traction on the terrain. Imagine a hard rubber ball on a hard surface, it will roll much further/faster than a softer rubber ball, as there will be less resistance and lost energy. Now think of the trail, that’s all very well and good on a straight line, but when going downhill, off camber, with a drop beneath, you want the soft rubber to grip and mould its form to the little imperfections of the ground to get maximum grip. As well as being high in traction, the Vibram® sole is hard wearing. Given the amount of time these have spent wandering the valley of Chamonix, along with trails, they are not showing any real signs of wear. Stability outsole flex groves aid flex in the forefoot, allowing the shoe to pop once at the end of the gait, providing that extra lift and charge of forward energy. Moving up and we have the midsole. You get a lot. Not as much as some other Hoka’s, but you aren’t left wanting. As this was my first real experience of a larger midsoled shoe, it has taken some getting used to. Running on the flats and uphill was fine, but it has been descents that have taken the greatest of transitions. Walking down steps was an odd experience truth be told. Having been using harder EVA’s for years, it took time to accept the feeling of your foot compressing the midsole through the movement. For me, I am happy most of the time, but I am left undecided if faced with a technical descent. It is the shoe or is it me? Having been programmed one way, it takes time to switch mentality and trust. Right now I can hear the minimal crowd shouting “I told you so!” but they should wait to hear the full picture. Given the Speedgoat’s height of midsole, they have a race flat heel to toe drop. 5mm. See, I said it was worth listening too. For people used to 4-8mm they will feel right at home, just a little taller. 33.5mm Heel to 28.5mm in the forefoot to be precise. These are a racing shoe. The upper. It’s not often I would say it is a thing of beauty, but the welded overlays at the base, combing with several a lace eyelets produce a stable platform which wraps neatly around the foot. The ultra lightweight No Sew Speedframe construction, or for you and I, that comfortable thing around your foot, breaths well due to a woven mesh allow maximum breathability. It is one of the most open structures I have seen, so on a winters day in the UK, you are really going to notice it. The front rand takes some abuse, though tunlike the rest of the shoe, is showing wear, from cracking of the colouration applied. As mentioned previously, the welded synthetic overlays provide the support for the shoe and allow it to be cinched tight, with micro underlays giving your foot greater comfort. I happily walked around barefoot on the campsite and never had any issue with rubbing or hot patches appearing. The heel cup gives the right amount of support and isn’t too high, preventing irritation around the ankle, and the hook at the rear is great for getting the shoe on in a hurry. Think Norse or Celtman triathlon for those wanting to save every second! Though narrow, the laces stay put when tied and the tongue is minimal, to the point you don’t really notice it. There is nothing worse than a thick tongue which prevents breathability, gets soaked and forms creases when tied. Sizing, I opted to go up ½ a size as usual, and this proved to work for me. I did find they were a little narrow around my little toe, but not enough to cause any issues. So there you have it, one of the hottest shoes on the market. It’s built well, bites into trails, is deceptively light and your feet are a high viz blur as you fly through checkpoints. But how did they perform? For me, I am still undecided. I think I need more time to train my brain to a new sensation. As I started out on the track, road and fells, I have always worn minimal shoes. I did find my feet tend to pronate a little as soon as I put them on, which I didn’t experience in the Mafate Speed. But once again this leads onto the conversation that all our feet and running styles are different, so what may cause issues for me may not for you. My legs never as felt tired from a run compared to a conventional shoe, and they were a blessing to put on when I managed to injure myself, as the extra cushioning and support allowed me to walk without looking like I’d been shot in the leg. For people taking on UTMB, Lakeland 100 and other longer ultras, a greater amount of midsole makes perfect sense. When I ran the 10 Peaks long course, I changed my other shoes at 30 miles, as they took a pounding in the mountains and didn’t give a lot back. I like the Speedgoat, whether in the subtle or “look at me I’m a trail runner” Acid & Cyan I was fortunate to receive. It gripped tirelessly, carried me when injured and I never had to question them when running up a technical course.